Urgent need for another PT! 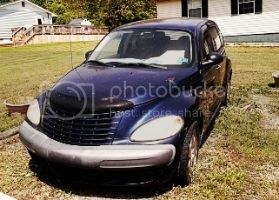 Sadly, my wife crashed her PT Cruiser this week. She is safe and sound but her baby is not. She was hit from the side and the rear. The car was totaled even after many phone calls begging to reconsider. $5000.00 is what we get from the insurance. 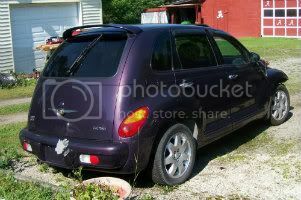 It was a 2000 PT Cruiser Automatic (120,000Miiles) with only one option I insisted she get, ABS. This was her 3rd PT and would not drive anything else. 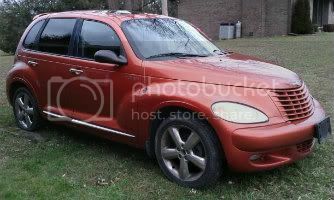 Anyway, I have not been on the market for a car little lone a PT. I'm not sure what and where to look for and of course the budget is low, I want to try stick with it if I can for now. Any tips will be very appreciated. Re: Urgent need for another PT! If you don't mind a Vert, there's a real nice (custom paint job, turbo) that just went for sale in our FOR SALE section of the forum. Is it the head room on the sun roof? Because many more have them than not. Least what I see. If 5k is the budget. I think you can find a nice one for that. I guess the plugs were diamond tipped and wires made from gold! The other one has speedo rolled back and accident record. So that one a bit over priced as well. Keep looking guys.